Have you been playing for quite a while and been mostly copying basslines and learning songs instead of being able to create your own basslines?? You do not have to wait for some elusive point in time when you’re ready to create your own bass lines. There is no official license you get, no credential, no certificate – however, you do get a hand emailed certificate these days if you finished our course. And our course definitely enables you to create your own bass lines! Applying what you learned – ie: creating your own bass lines It’s best to balance the three areas out over time. All of these phases are important. They may not happen in equal intensity at the same time (unless you do a structured course like ours). Do make sure that you get to all of them eventually or somewhat equally when looking at this over a longer time period. It is extremely thrilling to do so because you meet your own inner musician. You meet yourself, your style! It’s exciting! Even with very simple means, you can come up with your own lines: all you need is a rhythmic nucleus and a chord (theory, essentially). It cements all the theory you studied firmly in your mind because it is like learning a new word – use it in a sentence and it will stick (Victor Wooten likes to use this great analogy!). By making it your own, you feel it under your fingers and make it part of you. Emotional impact: if you point your attention correctly it will help you reveal the musical effect certain devices have (for example, various modes have different emotional qualities to them). The lines you studied and learned to play will show you what’s possible and enable you to play similar things (even if simplified). They become part of your fabric and style. And mainly, you bring all aspects of your studies together (doesn’t mean you have to pack everything you learned into each line; you pick from your “library” though). This is a unique task for your mind. Nothing is quite like it. Some see it as finding new combinations of elements you have encountered before. Other times it may feel like inspiration flowing directly from some unexplainable source. Nothing is quite as strong at solidifying what you have learned and putting it to the test. Strengthen that creative “muscle” from day one. It will ignite a spark that will propel you forward and entice you to learn theory and rhythms. And it creates a mental space that is a unique challenge not only to your musical self but also your personality. See it shine through even with the simplest of devices. It is not the complexity that counts, but that this is genuine you. Even if it may be “far from perfect” or “not ready for prime time”, it will teach you something about who you are. It’s thrilling. 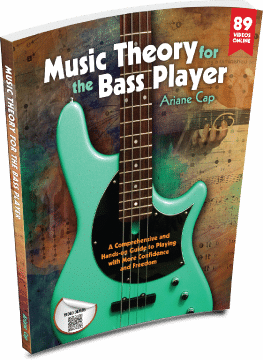 In our Course, Music Theory for the Bass Player – The Course – we go through the most important theory a bass player needs and put it to use in a variety of creative exercises. From “Groove and Fill” to “Call and Response” to “Creative note finders” to countless bass line creation exercises, including in various styles. And we show you the technique to make this all possible. In this course you will learn how to create your own basslines.